Atlanta, GA, December 1, 2017 – The Atlanta Alumnae Panhellenic Association (AAPA) (http://www.atlantapanhellenic.org), a community-based organization composed of alumnae from National Panhellenic Conference (NPC) member fraternities, has launched its annual scholarship competition. Applications are now available on the AAPA website (http://www.atlantapanhellenic.org/scholarships). 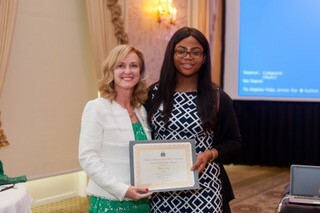 Since 1932, the AAPA has provided financial support to women from the Atlanta area as part of its goal of supporting academic achievement among women. This year, the AAPA will grant $21,000 in scholarships, the highest amount it has awarded in its 91-year history. Past winners have exemplified AAPA’s Panhellenic Spirit of academic achievement and excellence in leadership, character and community service. “Any NPC Sorority would be proud to call AAPA Past winners, Sister,” said Rebecca King, current AAPA President. High school awards will be $1,500 each, Collegiate awards will be $2,500 each, and the Alumna award will be $2,000. High School Senior Honors Scholarship – for female students planning to attend a four-year college/university with NPC sororities on their campus with legal residence in the metro Atlanta area. Collegiate Scholarship – for Rising Junior or Rising Senior NPC sorority members attending Georgia colleges/universities with legal residence in the metro Atlanta area. Alumna Scholarship – for an alumna with legal residence in the metro Atlanta area who is continuing her education. The application deadline for all scholarship submissions is March 1, 2018. Late or incomplete applications will not be considered. Award winners will be recognized at the AAPA Spring Scholarship Luncheon and Silent Auction on April 28, 2018 at the Cherokee Town Club in Atlanta, Georgia. More information on the AAPA scholarship competition, including criteria, requirements, and applications, can be found on the AAPA website: (http://www.atlantapanhellenic.org/scholarships). Founded in 1927, the Atlanta Alumnae Panhellenic Association (AAPA) (http://www.atlantapanhellenic.org) is a national award winning, community-based organization affiliated with the National Panhellenic Conference (NPC). AAPA membership is composed of 21 representative alumnae from the 26 NPC member fraternities. For over 90 years, the purpose of the AAPA has been to inform fraternity women of current trends, promote the fraternity system, improve the Panhellenic image, and stimulate a continuing interest in Panhellenic affairs.